How much time to do you spend every day looking for a trade setup? If you have a good system, and you know your setups well, do you spend a long time looking through a dozen stocks or currency pairs, checking to see if your setup is there in each one? I’m getting more and more excited about the idea of scanning. With scanning, you only need to program in your setup criteria, which financial instruments to scan, and let the scanner tell you which stocks, futures or currency pairs look like they’re getting ready for your set up. The trick is, of course, to write the scanner, but that’s what we’re here for, right? A scanner is a lot like writing an indicator for a trading platform, but instead of drawing it on the screen for one chart, the scanner checks multiple charts, and just lets you know which chart might be the ones you should look at. In John Person’s book Mastering the Stock Market, he spends a bit of time talking about scanning. It’s in the section on Relative Strength, which I wrote about last week. So, a quick recap here. 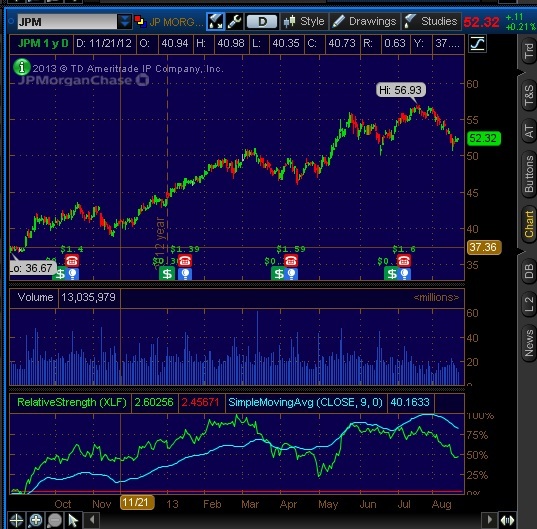 On the chart, the top graph is the stock we want to trade; in this case, JPM. 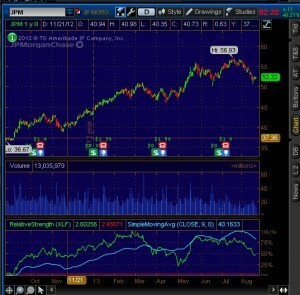 The lower graph shows the relative strength of the JPM stock with the financials XLF Exchange Traded Fund. Additionally, on the bottom graph, there’s a 9-period moving average that gives us some cross-over points. Where ever the moving average and the Relative Strength lines cross, that’s a change. If Relative Strength is above the moving average, that means our stock is doing better than the rest of its industry, and we want to be in that stock. When the Relative Strength line falls below the moving average, that means it’s doing less well than the rest of the industry, and we want to be out of that stock. If the moving average has crossed the Relative Strength in the last few days (configurable), alert me. It would be fairly simple to do this with a variety of platforms, and we looked at something like this from Howard Bandy in his Quantitative Trading Systems book. We’ll look at that more closely in an upcoming blog post. "Get my free programmer's checklist"
The checklist gives you step-by-step instructions on how to create the perfect automated trading system. Yes, I’m a fan of Trader Interviews too. They have such a huge library of interviews, and really good stuff. 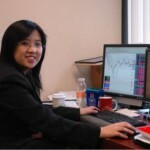 TraderTechTalk is more narrowly focused (automated systems, etc.) so there’s room for both.